I used to have almost a thousand hormonal and emotional preteen girls following my missteps. And I did nothing about it. I regret that—not because it would’ve made me pretend to feel less messy emotions or be more self-aware, but because I never tried to reach out to those hundreds of girls. I never bothered to learn their names or memorize the way they parted their hair or the bangles that always clanked when they ran their fingers through it in mock exasperation. And isn’t that the way we learn? By asking the questions we have and hoping someone else throws back an answer that’s easier to swallow? Isn’t that the reason we read a stranger’s words and call them understanding? 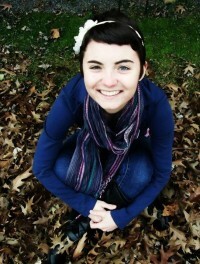 I was fifteen. I had a quote Xanga. Quotes From The Heart, it was called. And it’s still floating around the ether, if ever you need to know what my fifteen year old self had to say about feeling out of place and less than loveable. I wrote about heartbreaks that weren’t yet real, boys who thought I was invisible, girls whose favorite pastime was passing notes in American Government with words like queer hitched to my name. And wouldn’t it be nice to punch her in the face and pretend it wasn’t me? I sat for hours trying to decipher that one. And six years later, I can tell you it’s a funny thing to say. It’s a funny thing to think you can deck someone in the nose and they won’t know it was you. It just doesn’t work. I think I would’ve asked those eight hundred or so girls what they thought about bullying. And boys. And beginning to dread gym class because you weren’t so good at the mile run or the shuttle run or anything that required putting one step in front of the other. I would have asked them what they clung to in my own missteps or what they hoped when they logged on and saw that I had updated since last they checked. I would have learned their worlds, one at a time, and tried to answer the questions they had the courage to ask. I hope you know you can do that with me. You can send me an email or a text message or a tweet. You can expect an answer that doesn’t put a label on what you’re feeling or try to tell you it’s nothing, really, to be fifteen and terrified of the girl sitting next to you, stewing with anger because you exist. Because you dared to breathe next to her. I hope you’re not holding your breath. I hope you’re feeling the burden lift. If not, begin today. 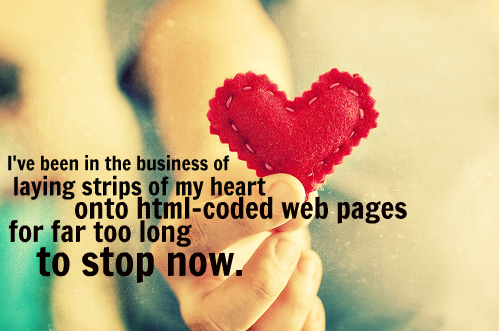 I’ve been in the business of laying strips of my heart onto html-coded web pages for far too long to stop now. If you are just finding me, I am here. Here. Ready for you.